It’s the New Year and like lots of you, I have a few resolutions in the organizing department. One of them is to label and properly store all of my antique textiles. I don’t have a ton of items, but what I do have is very important to me: a quilt made by my father’s great aunt, some lace I brought home from a research project in Malta and lots of hand knit, crocheted and tatted items made by my husband’s grandmother and my mother’s grandmother. Many of these pieces aren’t in keeping with my current home décor style- but I know my tastes will change over the years and I want to protect them for future use and/or for use by my children (and grandchildren and great grandchildren, with any luck!). I also want to make sure that I preserve the information I have about each item: who it was made by, who it was made for and the approximate date it was made. Now, in my defense, I was given many of these items wrapped in plastic and not knowing what else to do with them, I kept them that way… even though the people who gave them to me warned that plastic was probably not a good idea. And indeed a good idea it is not because it causes yellowing and mildew from off gassing and not allowing the fabrics to breathe properly. Luckily, I have not (yet) caused any major plastic related issues for my antique textile stash. So what is the right way to store antique textiles? That all depends on your circumstances, but there are a few key attributes of any effective antique textile storage solution. 1. Wrap an empty fabric bolt or tube in aluminum foil. 2. Create a foil packet for an index card/sheet with information on who made which items, when they were made, etc.. You could also use acid-free index cards and acid-free pens, but due to some nuances with the whole “acid-free” label that I will discuss below I’m just going to use what I have and wrap it in foil too. 3. Place foil information packet either inside of the tube or right on top of the aluminum wrapped bolt and wrap the entire thing in acid-free tissue. 4. Wrap antique textiles around the prepared core using acid-free tissue as interleaving. 5. Wrap completed bolt in unbleached cotton fabric. Secure with cotton string, leaving ends open to prevent moisture accumulation. 6. 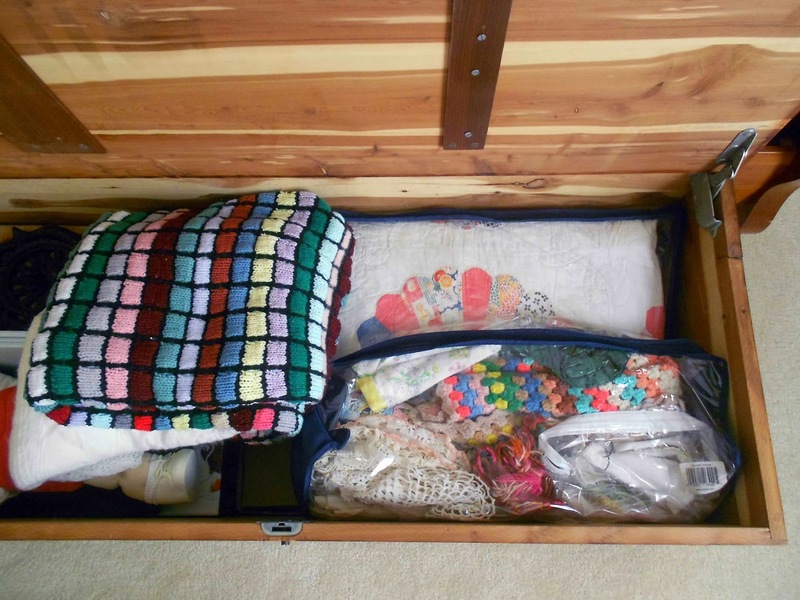 Place inside of cedar chest or corrugated box (to be safe you might line the chest or box with acid-free tissue as well. I will if I have enough left). 1. Wrap a 60” long core in aluminum foil (this size core can easily be found in any fabric store that carries larger width fabrics for fashion or home décor, if you need some and are in our area, contact me!). 2. Put an index card with information inside of the tube. Wrap the entire thing in acid-free tissue. 3. If necessary, fold quilt with acid-free tissue inside of the fold and then roll it gently around the core. If you have a one-piece larger textile, the good folks at the University of Georgia recommend in this article that you roll in the warp direction, since it is usually the stronger element. 4. Wrap completed roll in unbleached cotton fabric. Secure with cotton string, leaving ends open to prevent moisture accumulation. 5. Put a reminder in your calendar to unfold and refold in a different place next year. It is generally recommended that you change the fold “periodically”. “Annually” is my interpretation of that word but yours can certainly be more or less frequent. As it tends to happen at some point in most projects, things got a little convoluted when it came to tracking down the right tissue paper to use. The “acid-free” tissue I sort of generically refer to above should, according to this article by the Smithsonian Institute, in fact be neutral pH, unbuffered acid-free tissue paper that is also lignin-free. Now, I’m no scientist, so I hope I explain this well, but from what I gather, most tissue paper will become acidic and brittle with age. The acidity will transfer to objects in contact with it, possibly causing these objects to become weaker and discolored. “Acid-free” tissue papers are specially processed to remove the stuff in paper that does that. Some acid-free papers are, in addition, buffered to an alkaline pH. These buffered papers are considered acceptable for cotton or linen textiles, but potentially harmful to silk or wool objects- so the official recommendation of the Smithsonian Institute is that antique textiles be wrapped in unbuffered (so neutral pH) tissue. On top of all that, the presence of lignin (I linked to the definition there but I won’t even pretend I understand a word of it) can make matters worse by turning paper that is currently neutral pH or acid-free acidic over time. Another tip I found over and over again from archivists of textiles and paper goods (both use the acid-free tissue) is the test your packaging with a pH pen even if it has a claim to be “acid-free”. I loved this post! Thanks for doing the research for us. I delved a little into this when I looked into hanging and displaying textiles but became easily confused when I couldn't get straight info. The more I create and collect, the more I want preserve all that effort for the future.